I love watching extreme sports. Anything where people achieve incredible things. It’s so impressive what humans can do! As the Winter gets underway my sons will watch and share a steady stream of extreme skiing videos online. When I see a skier doing double cork backflip with a grab, in a halfpipe, I think – Wow, they’ve practiced a lot. Practice is the repetition of an action with the goal of improving. It’s repeating things over and over until they become second nature. Practice builds habits. Have you ever thought that way about your church community? Funny isn’t it. But the Bible says practice meeting together and get really good at it. It says ‘Don’t give up meeting together, but make it your “habit” to gather for encouragement and stirring.’ That’s the idea of Hebrews chapter 10. Not gathering just for our own thrills, though being together should be pleasant and positive. Gathering to inspire each other to love God, love people and love the nations. So we gather in and we send out, gather in and send out, and we get better and better at doing this, until all peoples have heard of Jesus, and then He returns. 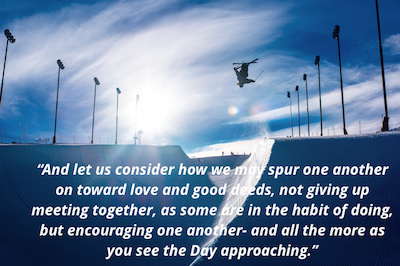 So, practice your backflips, and keep on getting together for encouragement and provoking good deeds. Bu Windsor on There’s Nothing That Can’t Be Fixed. Matt Perry on Don’t give up communicating across cultures! David on Don’t give up communicating across cultures! Kevyn on Should we pray for unreached peoples to have dreams and visions of Jesus?